Background: In recent years, nanotechnology has been known as an integrated knowledge collection which involves various fields. One of the developing fields of nanotechnology which has achieved significant approval is named nanobiotechnology. Nanobiotechnology is a combined form of biology and nanotechnology that incorporates the synthesis of nanoparticles(NPs) that are less than 100nm in size and have following use in biological applications. Objective: The present review study is focused on the variety of nanocarriers and their use in biomedicine and tumor diagnosis and treatment. Results: Conventional therapeutic drugs have exhibited substantial limitations. Therefore, significant attainments have efficiently been made in nanobiotechnology for delivering drugs to the position of action, and reducing their side-effects and limiting radiation therapy toward tumorous sites. So far, several polymeric nanocarriers integrating cytotoxic therapeutics have been made. There is a need for modulation of size and surface features of NPs because unchanged NPs are cleaned from blood circulation. In order to increase biological distribution of therapeutic drugs, irradiation effect, and better tumor imaging, several modified nanocarriers have been developed in optimum size as well as altered external part. 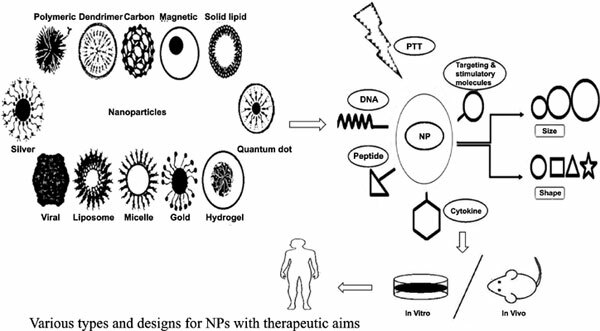 Conclusion: In this way, NP is known as an efficient and alternative approach for various aims, including drug delivery, PTT, gene therapy, imaging and diagnosis. There is an anticipation about the contribution of NPs in the field of efficient cancer treatment. Furthermore, NPs may be a proper approach in the treatment of other diseases such as HIV/AIDS. The present review focuses on the variety of nanocarriers and their use in biomedicine and tumor diagnosis and treatment. Nano-biotechnology, nanoparticles, biological usages, therapeutic drugs, irradiation, tumor imaging.